This church, with its excellent accoustics, is one of our favourites in which to sing. We were delighted therefore to be invited to perform there as part of the Mumbles Festival of Music and the Arts. In spite of a howling gale and lashing rain, a reasonably sized audience thoroughly enjoyed the evening, as we were joined by Parti Llwchwr ladies choir. The concert had been preceded a couple of days earlier by a wonderful piano and organ recital by our accompanist, Hywel Evans, with Glen Crooks. We choristers all know how skilfully Hywel copes with the requirements of our choir practice nights, but it is a revelation to hear him play as a soloist. We were joined by Parti Llwchwr in Anfonaf Angel and O Gymru (which led to an encore). Our soloist was bass Huw Roberts who sang an aria from The Marriage of Figaro, Cân Yr Arad Goch (Song of the Plough), and Bless This House, accompanied by D. Huw Rees. Parti Llwchwr, conducted by Janet Jones and accompanied by D. Huw Rees, never fail to impress with their beautiful tone, diction, and stage presence, and we were treated to a mixture of Welsh and English songs, ending with the lovely Lausanne. We were delighted to be asked to help the band celebrate their 125th Anniversary in Cwmtawe Community School, Pontardawe. With our MD D. Huw Rees and Accompanist Hywel Evans we included nine items from our repertoire, with bass Huw Roberts singing the solo parts in Anfonaf Angel. After a short rehearsal we combined with the band in Irving Berlin’s Alexander’s Ragtime Band, and judging by the audience’s reaction it was a great success. With two MDs each conducting their own performers, it went extremely well. The band was conducted by Jeff Hutcherson, with several excellent solo performances on many instruments as they played a wide range of band standards and a few surprises, such as Elton John’s Your Song. In a moving tribute to their late member Philip Loveday they played Abide With Me combined with The Last Post. As they played, our own late chorister Percy Morgan was in our thoughts. Conducted by Dafydd Lewis, the Junior Band showed much talent as they played their four pieces. Dafydd had thrilled us with his own performance of Grandfather’s Clock. We thank the band for the opportunity to help celebrate such an auspicious occasion, and we hope to be able to join them again one day. 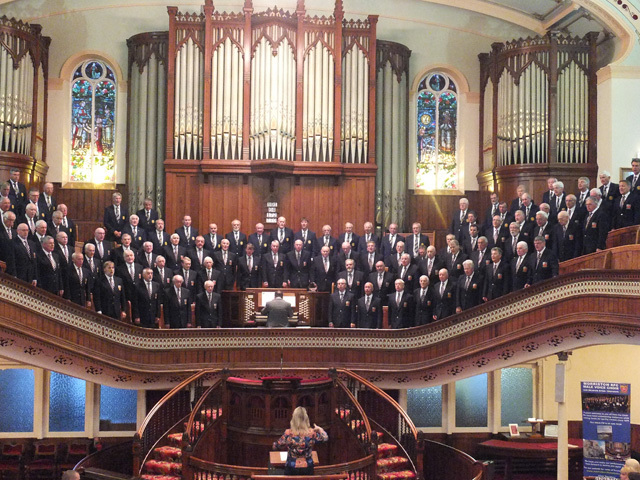 In October 2016 we sang in Oxford Town Hall as guests of Oxford Welsh Male Voice Choir, and this was the return concert with them as our guests in Tabernacle Chapel, Morriston. At the last minute their coach was unable to bring them but they overcame this by coming by car, for which we are extremely grateful. Both choirs have different seating arrangements, with the four voices a mirror image of each other, and as we were due to sing together in seven songs as well as individually, this caused quite a logistical problem which was swiftly overcome by our choir marshal. Conducting and accompanying duties were shared between our respective musical staff; Helen Swift and Alex Howgego for Oxford, and D. Huw Rees, Hywel Evans (organ) and Rhiannon Pritchard (piano) for Morriston RFC. With full attention being paid by choristers to the conductors’ unfamiliar interpretations and following a short afternoon rehearsal, this arrangement worked very well and was greatly appreciated by our audience. The wonderfully melodic Parti Llwchwr ladies choir are usually led by Janet V Jones but sadly, due to a family bereavement that morning, she was unable to be with them. However, her place was taken by the ebullient Marie Richards, whose comments and introductions helped to lighten what could have been a sad occasion for her choristers. They sang six songs from their repertoire, accompanied by D. Huw Rees, and we joined them in Anfonaf Angel and O Gymru (which can be viewed by clicking on the link). One of the guest singers in our 2015 Annual Concert was the young tenor Rhydian Jenkins from Maesteg, and we were delighted that he was able to join us again. With his accompanist Kim Lloyd Jones he sang a programme of mostly Welsh folk songs, plus Schubert’s Standchen and Bring Him Home (from Les Miserables). He received a great reception, and Oxford Welsh MVC were so impressed that they will be considering Rhydian for future bookings in Oxfordshire. The two male choirs joined together in the finalé, which included World In Union (again, click on the link). Following this most enjoyable concert we entertained our guest choirs at Morriston Rugby Club, ending the evening with a buffet, chat and songs before most of the Oxford contingent had to head back up the M4 (with their designated drivers at the wheel, of course!). During the course of the buffet our Chairman Huw Roberts presented two photographs to his opposite number from Oxford, Phil Lewis. They had been donated by our bass singer Richard Davies whose great uncle Tom Jones had been a founder member of Oxford Welsh, and showed “Uncle” Tom with his choir. It was a wonderful evening of song, and we thank our friends from Oxford for making the considerable last-minute change to their travel arrangements to be with us. There are some photos on our Photo Gallery page. All three choirs singing together. Thirty members of Valley View High School choir in the Lackawanna Valley, Pennsylvania had been hand-picked for a two-week tour of south Wales. Their area has had strong links with ours since 90 mining families emigrated there from the Swansea Valley in 1830 to share their expertise in extracting anthracite, the fuel that enabled USA industry to flourish. 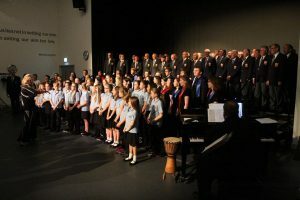 This concert, held in Morriston Comprehensive school’s overflowing theatre, was one of several they gave during their stay. Under the direction of their Choral Director Gina Pascolini and accompanied by Marty Ort and student Eric Lee they gave a highly polished performance, which included Freddy Mercury’s Bohemian Rhapsody (with torches! ), and a lovely arrangement of Calon Lan in Welsh. The rhythms of Sililiza had many toes in the audience tapping, and Kasidy Leggin overcame a problematic sound system to give a creditable performance of Death Of A Bachelor. With their conductor Ruth Evans and accompanist Craig Rees the youngsters of Cwmrhydyceirw Primary School choir sang a confident and most enjoyable programme, which included Calon Lan sung to the tune of The Rose, Doh Ray Me, and Open My Eyes Lord. So much did we enjoy hearing them that we hope to invite them to sing with us again before too long. Three students from the Comprehensive school added to the evening’s entertainment: guitarist Sam Ellis played Surfing With The Aliens with a multi-track backing, Ellie Jones sang Bring Him Home and Forever Young, deftly overcoming a momentary mental block, and Kyle Owens sang Bowie’s Life On Mars. Conducted by D. Huw Rees and accompanied by Hywel Evans, our own programme was quite short to allow the young people to enjoy entertaining in public, and it ended with the USA youth choir joining us in singing Rachie, again in Welsh, and without copies! They also joined in the Welsh national anthem to bring an enjoyable concert to a close. There are several photos on our Photo Gallery page. 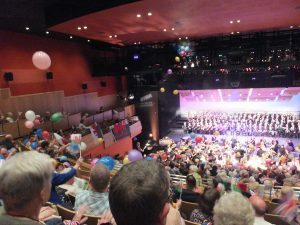 Llanelli’s Theatr Ffwrnes was a sea of colour for this annual extravaganza produced by Jeremy Hywel Williams, and conducted by his father, John, who has such an influence on music in the area. His girls’ and boys’ choirs and the recently-formed Angelicus Celtis were supported by the British Sinfonietta in a wide range of musical numbers, with the performances of young soprano Hannah Seward one of the many highlights. We shared the stage with Llanelli Choral Society, and were conducted in our contributions by D. Huw Rees, accompanied by Hywel Evans (piano), and Huw Tregelles Williams (organ) who also accompanied many of the other performances throughout the evening. Audience participation was encouraged and assured with flags provided, coloured confetti and countless balloons dropped from the ceiling. As it was Armed Forces Day and close to the 100th anniversary of the start of the Battle of the Somme, remembrance also played a part in the event, with readings, performances, and falling poppy petals. The Hywel “dynasty” certainly know how to put on a show, and we thank them for the opportunity to join them once again in the last Night Of The Proms. We look forward to meeting up again on 10th December for a Massed Voice Festival of Christmas at Swansea’s Brangwyn Hall. Our much-loved General Secretary J. Layton Watkins was also former Chairman and current Secretary of the Welsh Association of Male Choirs (WAMC), and following his untimely death in January the Association decided to hold a concert celebrating and appreciating his contribution to the world of male choirs in Wales and further afield. With his ever-supportive widow Gwen and son Jason in the large audience, it was an emotional and moving evening. Ffion Edwards and Aaron Pryce-Lewis are two young singers who owe a large part of their success to the Association’s promotion of up and coming singers, a project close to Layton’s heart, so it was appropriate that they should perform in his honour tonight. With our MD D. Huw Rees, pianist Hywel Evans and organist Huw Tregelles Williams we played our part in tribute to our very good friend and mentor, although it was not easy to sing with a lump in one’s throat. Huw Tregelles Williams is President of the Choir and WAMC, and he gave a typically eloquent tribute to Layton, whom he knew so well. Jason responded with his own tribute and thanks to all concerned. The welcome address and closing prayer were given by the Rector of St David’s Church, Canon Stephen Ryan. WAMC is grateful to all the representatives from its member choirs who attended in support of the event, which raised £1,195 for Macmillan Cancer Care through a retiring collection. 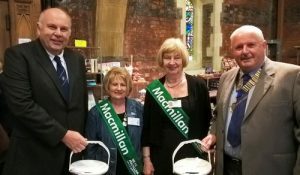 The photo shows from L-R: Richard Howells (WAMC Vice Chairman), Hilary Jenkins and Marilyn Evans of the Macmillan Daffodil Group and Ellis Davies (Association Chairman). A huge amount of work goes into arranging the most important concert of our year, so it is extremely gratifying when we take our places on the balcony in Tabernacle Chapel and see a sea of faces before us. This was one of those nights! Conducted by our MD D. Huw Rees and accompanied by Hywel Evans (piano) and Huw Tregelles Williams (organ), our programme included several pieces that we had been working on for some time but which we had not performed before in public. Judging by the audience’s appreciative reaction, our hard work had paid off. Our Bass soloist Huw Roberts sang Anfonaf Angel. 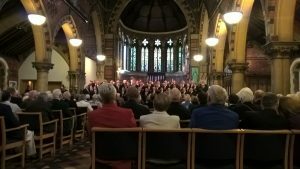 It was a poignant and emotional evening for us because we were without two long-standing stalwarts of the Choir, Alan Phillips and Layton Watkins. We were delighted to see a whole row of twelve of Alan’s family and friends, and as a tribute to Layton, who had served for many years as our tireless Secretary, we sang The Lord’s Prayer, and Y Darlun which has special significance for his family. There was much sniffing among the choristers as we managed to finish singing these two! Our Deputy MD Helen Wyn plays an important part in adding polish to our performances, so we were delighted to be conducted by her in the Mansel Thomas arrangement of Fantasia On Famous Welsh Airs, which we shared with our guest soprano, Gwawr Edwards. Gwawr has an impressive musical CV which includes many operatic roles, foreign tours, and recordings. We last sang with her in Margam Orangery at an RAF function last year, and we will meet again in October in Carmarthen for a British Legion concert. Her well-chosen programme included I Believe, I’ll Walk With God, and traditional Welsh and Italian songs. The Choir joined her in singing The Holy City, and we joined forces with Gwawr and Huw Roberts in the finalé – O Gymru – which was greeted with tumultuous applause. Gwawr was accompanied by Annette Bryn Parri, who is one half of Piantel which, as its name implies, is a piano and harp duo (‘telyn’ being Welsh for ‘harp’). The harp half of the duo is Dylan Cernyw. Many of us had not heard Piantel perform live before, but we and the audience greatly enjoyed their choice of music which varied from Gershwin’s Summertime and Pachelbel’s Canon to Agustín Lara’s Granada, with a couple of Scott Joplin’s rags causing much swaying in the audience. They were joined by Gwawr in their version of Calon Lân to the tune of The Rose (made famous by Bette Midler). Our President, Huw Tregelles Williams OBE, had written a touching tribute to Layton in the programme, and we are due to celebrate his life in a concert in Neath on 16th June. In recognition of his work and the support given by his wife Gwen, we have invested her as a Life Patron of the Choir. During the course of the evening three choristers were presented with their certificates for 25 years continuous membership: Paul Baker, Roy Seaborne, and Huw Williams. Our compère for the evening was Beverley Humphreys, well known for her singing, writing, and as a BBC presenter. Beverley had done her homework, and gave backgrounds to some of the songs, adding her natural charm to the concert. She also made a good job of trying to connect two Australian visitors in the audience – one upstairs and one on the ground floor! This was a concert to remember and was generally considered to be one of our best, as the many comments on social media and personal messages have shown. There is a selection of photos HERE. A couple of videos have been added to our YouTube page.